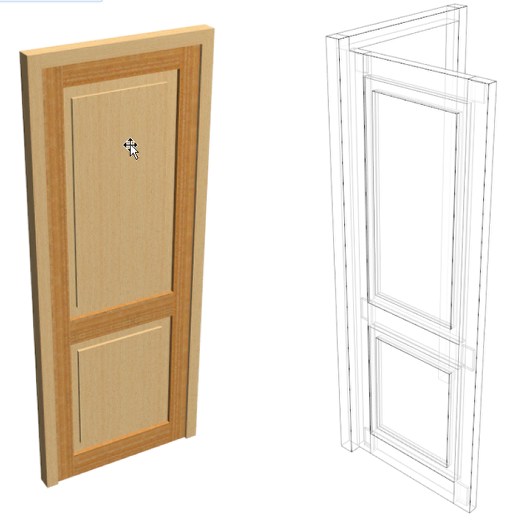 Polyboard is great for fast and efficient design and manufacturing of cabinets and furniture from sheet materials, but has certain limits in showing detailing in 3D presentations of solid wood objects. This is mainly true for profiled sections such as mouldings and turned parts. Although you can get around this by exporting the project in DXF 3D and add details in another software like SketchUP or Autocad but for some details it’s often possible to trick Polyboard into displaying a reasonable approximation. In this video I show how to use the “Inner tooling” functions to simulate a raised panel in 3D. As you can see from the video, that although Polyboard has limited solid wood profiling commands it’s amazing range of versatile assembly functionality can go a long way towards creating shapes to show off your ideas. As well as creating simple raised panels it’s also possible to use the inner tooling command on the raise panel itself. You can create very original effects by alternating materials and thicknesses from section to section. In the above examples I have created cut outs in cut outs and altenated the materials to give different effects. 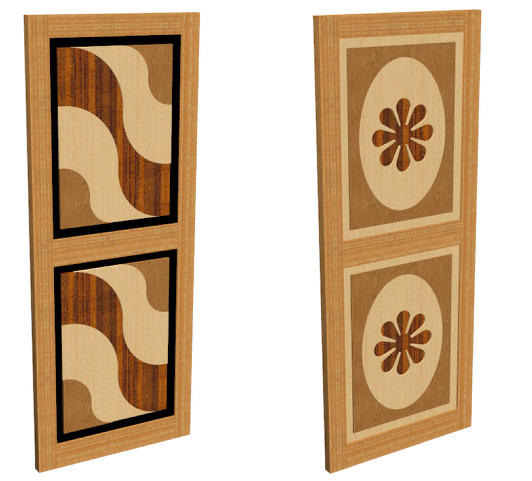 These designs were created in literally a few minutes from the standard Polyboard shapes and commands. The wavey panel on the left was created using a inner tooling for the the raised panel and surface splits (another very neat Polyboard function) to divide the central panel into several parts using different materials. You can also import you own personal drawings to use as cut outs. The shapes you import will then become standard parameteric shapes that you can resize at wil to use as cut outs (inner tooling) or panels splits. And don’t forget Polyboard creates all the cutting lists and manufacturing drawings and CNC files as you design. As you can see Polyboard has an amazing set of tools that are very easy to use to create all sorts of wood working projects very quickly. Designing and playing with various variations is very fast, easy and great fun too!! Hope this video has been of interest to you. Don’t hesitate to leave a comment if you have any questions or remarks. Brilliant Ness and thanks for a very swift video reply. More than I was expecting! I get what your saying about watching the cultists etc and I think I could probably get my head around this. It really is just for the presentation side that you might want to show to a customer. and presentation side of things. I’m still currently playing around with the free version and have decided that I’m going to take the plunge. Polyboard is like a treasure chest. Once you open the lid and dig you’ll find a wealth of bits and pieces and some real gems.